Anticipation and fishing--anglers always hope for the best when they head out to try and outsmart a creature with a brain that’s just a shade larger than a pencil eraser. A lot of times the fish wins. But when you hit on one of those days where everything clicks into place, you head for home thinking, “I’ve got this all figured out. I am a shad fishing god!” Then reality comes around and smacks you in the face. 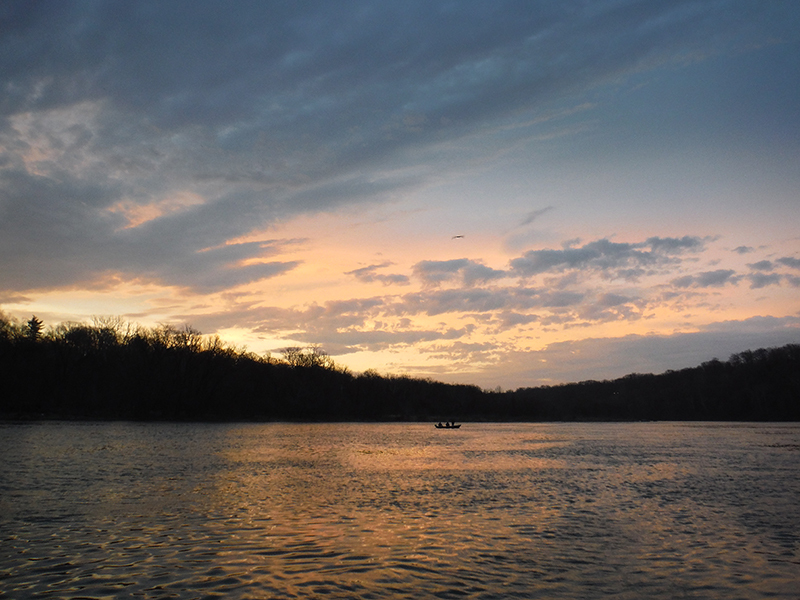 The sun was just beginning to rise as I motored out of Fletcher’s Cove and headed for a spot just outside the current seam on the Potomac River. I did pretty well when I fished here on Friday and I thought it was a “for sure” thing to repeat the feat today. I dropped the rock and adjusted the anchor line until I was lined up in the same spot. The current was running a little slower, but I didn’t see that as a major problem as I quickly rigged the fly rod and got down to do some serious shad fishing. It was slow, but I wasn’t worried since it started off that way the last time I was out. Within 20 minutes I felt the sharp tug and I soon had a fish in hand. About this time other folks were rowing or motoring out of Fletcher’s Cove and the lineup of boats soon stretched from Walker’s Point to Catfish Beach. I continued to fish and picked up a shad here and a shad there. The fish seemed to be moving all over the place and there was no one spot where they were settling in. However that wasn’t the case with the people fishing below me. The boys from the Tyson’s Corner Orvis store were out fly fishing for shad, from what I understand this was the first time for them, and they had all the fishing variables right: right place, right depth, right current, right fly and right presentation. It was awesome to watch. For every fish I caught, they brought in six to eight. Shad, after shad, after shad. It was getting stupid ridiculous--cast across the current, let the line swing and sink, either a dangle or a few strips and it was fish on. This went on for hours. I caught my share of fish, but it was interesting to watch them haul in the Hickories. The key to their success, like in most fishing, was mechanical repeatability. If it ain’t broke, don’t mess with it. There was consternation on the boat when one of the anglers lost “the lucky fly” after I don’t know how many fish. But he just picked up where he left off when he tied on another. 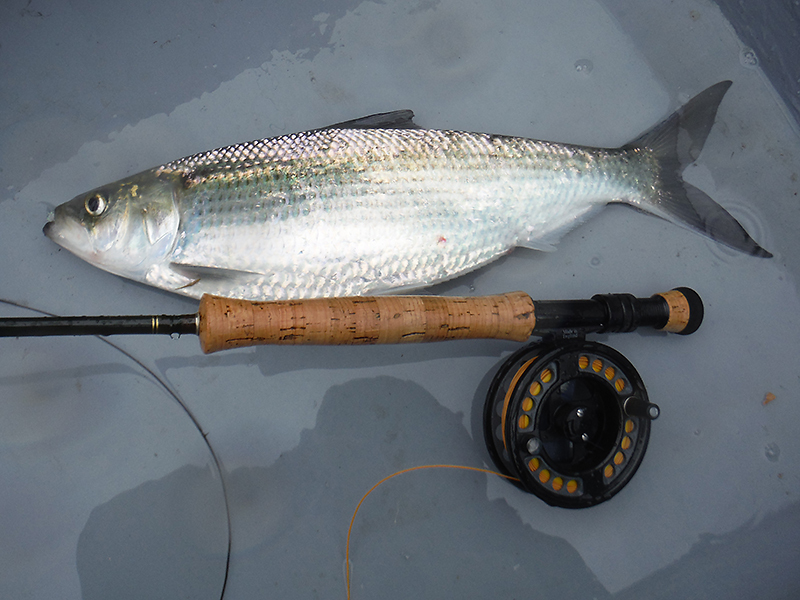 I didn’t have a “magic fly” but pretty much caught Hickory shad on just about everything I had in my box. Color didn’t matter. Size didn’t matter. They hit them all. It was just a matter of locating the fish. I would catch five in one spot then it would go dead. Then I discovered the fish were moving from just outside the main current into the softer water closer to the cove so if I pulled in a few shad close to the main current and the fishing suddenly went cold I just shifted the cast, fishing right to left, and I would hook a couple more fish until they eventually moved beyond casting range. I didn’t pile up huge numbers of shad like I did on my last trip. That was an anomaly. 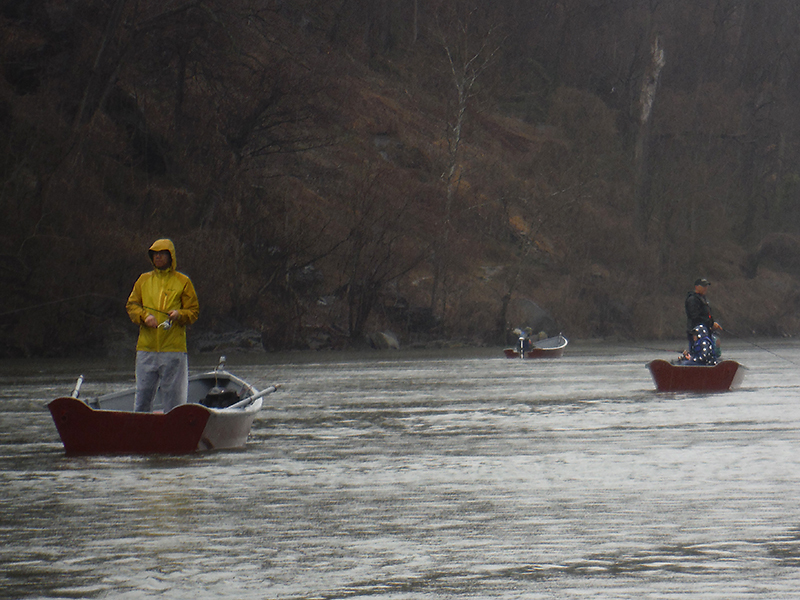 With the exception of the Orvis boys, this was more like what shad fishing is like at this time of the season. I was back to normal. The biting died down around 1pm. I was still picking up a fish here and there, but it was very slow. The Orvis boys were still pulling Hickories in but the pace had slowed for them too. The wind picked up around 2pm and this was making it really difficult to fish. The boats were being blown all over the place and it was difficult to get the fly in the proper spot, so I decided to call it a day and head for home. EQUIPMENT: I used a 7 weight rod and an Orvis Depth Charge density-compensated full sink line. Shad flies in size 2 to 8 in various colors. During shad season the boat rental office opens at 7am, but when the season is hot and heavy they do open earlier. Boat rental fee, plus tax, is $26 for the day. You need a D.C. fishing license ($10 DC resident and $13 non-resident) to fish and you can get them at the Fletcher's rental kiosk along with fishing equipment, bait, hot dogs, drinks and ice cream.